Home » SPANGLISH SPEED DATING! Spanglish exchange, a St Valentine’s special on Wednesday 13th February. 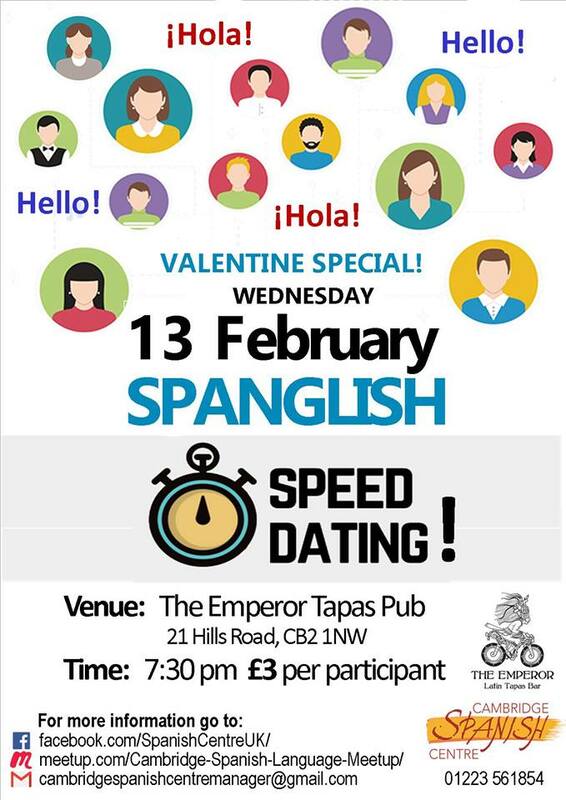 For an evening of fun, “Spanglish” conversation, and the chance to meet new people, come and join join the Cambridge Spanish Centre in this friendly Spanglish Speed Dating event. Any degree of Spanish mixed with English, or viceversa, that participants are capable of. Everybody welcome! The price for this event is £3, and includes conversation/question suggestions! Warm up for Valentine’s Day with our fun and friendly event and join us at the Emperor Latin Tapas Bar on 21 Hills Road, CB2 1NW, at 7:30 pm.